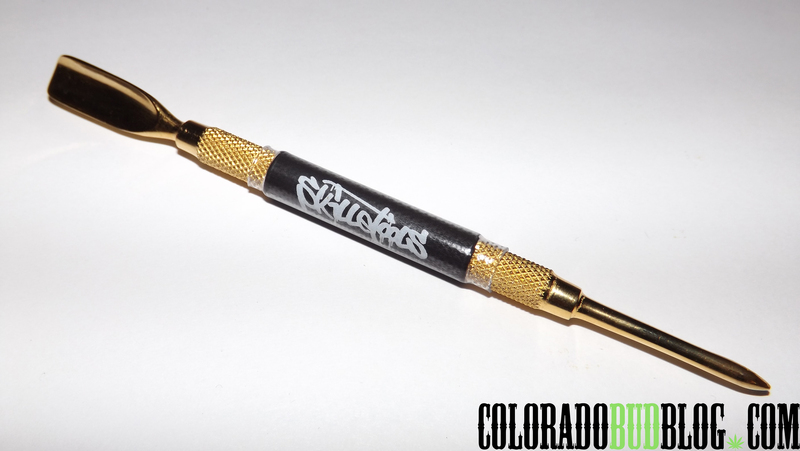 I was in Durango today shopping at Gandolf’s Smoke Shop when I picked up the Gold Digger Dab Tool by Skilletools. I’ve had my eye on this thing for a while, but didn’t want to throw down the cash for it, as it cost over $30! However, I must say that it was worth every penny. fat “grain shovel” scoop on the other! I bought this for the scoop end, as it makes for scooping big chunks of crumble into my Honey Bucket very easy. This thing is awesome! I would HIGHLY recommend this tool to anyone who wants to take giant dabs of crumble in the easiest way possible! Check out Skilletools online at http://www.skilletools.com and in your local smoke shops!